Recent warm weather has produced water temperatures in Lake Wingra that are the same as a swimming pool! At all depths the temperature of the water is around 80 degrees Fahrenheit. A temperature that can refresh on a hot day. Only 3 weeks ago it was a more stimulating 67 degrees. To add to your pleasure your volunteer monitoring team measured water clarity values they have not seen before. The Secchi Disc readings are around 8 feet compared to only 3 feet just three weeks ago. Since the team started monitoring 2 years ago, the highest value they have seen is 5 feet. A paddle around the lake might find you seeing the bottom of the lake in many places. This is especially fun where the blue gills are nesting. 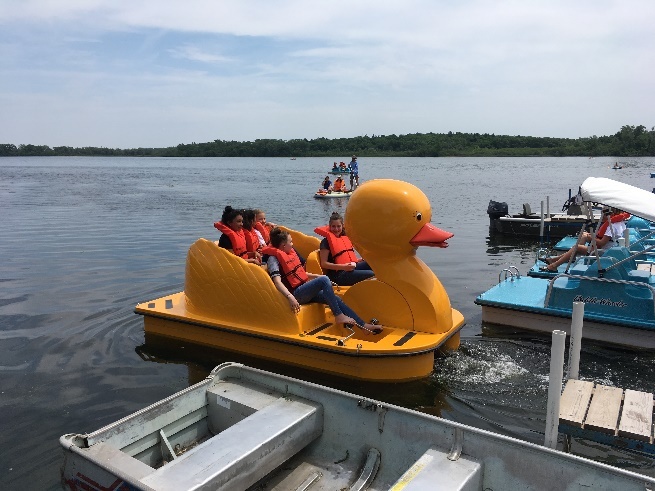 As shown in the featured image above, sixth and seventh graders from Edgewood Campus School learned about the temperatures and clarity of the lake on a field trip to Wingra Park. Wingra Boats helped by supplying all kinds of craft to help them do water sampling in the lake (Figures 2 and 3). They will analyze the water samples for phosphorus, nitrates, pH, and dissolved oxygen. All this data is helpful in our efforts to understand trends in Lake Wingra water quality. Figure 3. 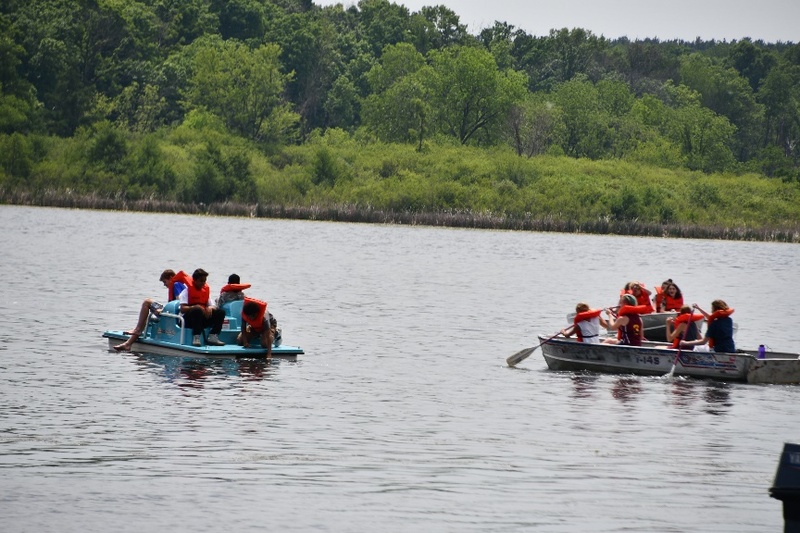 Students use paddle boats and row boats to reach their sampling sites. 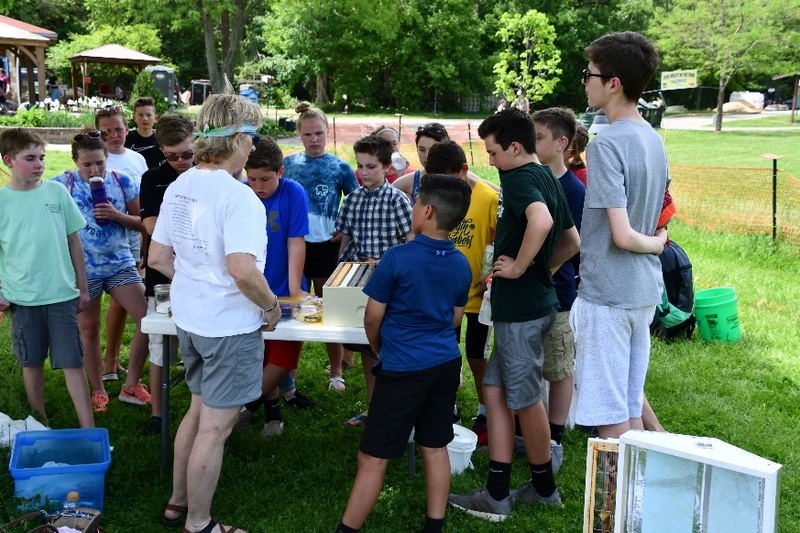 They also had a chance to learn about bee keeping and native edible plants (Figure 4). Thank you to the Edgewood teachers for their big effort to collect data and help these students enjoy our lake. They especially enjoyed jumping in the lake at the end of the field trip. Figure 4. Bee keeper, Mrs. Goonan, explains the challenges of bee keeping. P.S. Does anyone have an idea as to why the lake clarity increased so dramatically?